Many types of flowers thrive during the fall months. Fall is almost here! As summer is wrapping up, now is the time to turn your attention to fall landscaping. Although we nearing a dormant season for many plants and flowers, other types of flowers continue to thrive during this time of year. With this in mind, there is no reason why your landscape should be bare over the next few months. Consider these five types of flowers to incorporate into your fall landscape this year! Often referred to as garden mums, chrysanthemum are a classic option for your fall garden. They are available in a variety of colors, such as shades of orange, yellow and red. However, you can also find these flowers in dark purple hues and even shades of white. Chrysanthemum flowers can take on a variety of styles and may look like daisies, buttons, or pompons. Garden mums require full sun and grow best in well-draining soil. The Maryland State flower can be a charming addition to your fall landscape. Not only is it beautiful, but it is also relatively easy to grow. It can withstand some of the harshest weather conditions and attracts a variety of wildlife such as birds and butterflies. Many people are under the misconception that black-eyed susans are only a summer flower. Although many species will begin blooming in the summer, they also bloom into the fall season as well. They range in size from as small as two feet all the way to ten feet tall In many cases; it may be necessary to use stakes to prevent these flowers from drooping too much. This unique flower features a grayish lavender color. It has a long blooming season, as it begins in spring and summer months, and carries over into the fall. Russian shade can grow in hot areas with little water. While it is often clumped together and used as ground cover, it can also be planted as a single plant. Although this flower may have a funny name, it makes for a beautiful addition to your fall garden. This type of flower is not a weed, nor will it make you sneeze. It gets its name because it blooms at the same time many other allergy plants. Sneezeweed looks like daisies growing in a variety of autumn colors. These colors include various shades of yellow, red, brown, and even gold. 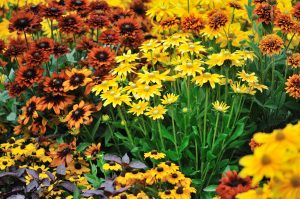 Sneezeweed requires full sun and needs moist soil in order to thrive. Coneflower is a member of the daisy family and is available in a variety of colors. However, purple is by far the most popular choice for fall. This perennial has a very long blooming season compared to many other species of flowers. Similar to the Black-Eyed Susan, Coneflower also attracts wildlife such as bees and butterflies. These flowers grow best when they are given full sun provided with well-drained soil. This entry was posted on Saturday, September 1st, 2018 at 6:26 pm. Both comments and pings are currently closed.